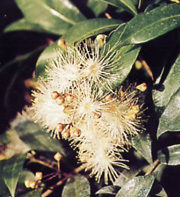 Also called Syzygium Paniculatum, Australian Brush Cherry. Has small handsome evergreen leaves which are firm and glossy and the flowers are white. If it receives enough light, the leaves will develop red highlights.